↑ 1.00 1.01 1.02 1.03 1.04 1.05 1.06 1.07 1.08 1.09 1.10 Tim Hornbaker (3 January 2017). Legends of Pro Wrestling: 150 Years of Headlocks, Body Slams, and Piledrivers. Skyhorse Publishing Company, Incorporated. ISBN 978-1-61321-875-4. ↑ 2.0 2.1 2.2 Harris M. Lentz III (1 January 2003). Biographical Dictionary of Professional Wrestling, 2d ed. McFarland. p. 298. ISBN 978-0-7864-1754-4. ↑ 3.0 3.1 3.2 "Mike Rotunda". Online World of Wrestling. สืบค้นเมื่อ November 18, 2016. ↑ 4.0 4.1 4.2 4.3 4.4 4.5 "Irwin R. Schyster". WWE.com. WWE. สืบค้นเมื่อ November 18, 2016. ↑ 5.0 5.1 Steve Pantaleo (24 March 2015). WWE Ultimate Superstar Guide. DK Publishing. p. 94. ISBN 978-0-241-23501-0. ↑ 6.0 6.1 6.2 Murphy, Ryan (August 14, 2009). "Where are they now? 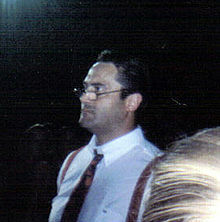 Mike Rotundo". WWE.com. WWE. สืบค้นเมื่อ November 18, 2016. ↑ 7.0 7.1 7.2 Kristian Pope (28 August 2005). Tuff Stuff Professional Wrestling Field Guide: Legend and Lore. Krause Publications. p. 384. ISBN 0-89689-267-0. ↑ Shawn Armstrong. Wrestling Moves and Smashes Pocket Encyclopedia. Lulu.com. p. 3. ISBN 978-0-557-13462-5. ↑ "Jimmy Hart profile". Online World of Wrestling. สืบค้นเมื่อ 2009-09-04. ↑ James Dixon; Arnold Furious; Lee Maughan (17 December 2015). The Complete WWE Guide Volume Six. Lulu.com. p. 32. ISBN 978-1-326-50746-6. หน้านี้แก้ไขล่าสุดเมื่อวันที่ 26 มิถุนายน 2560 เวลา 22:49 น.